You can’t resist the call of the camera and you are always ready to run outside to take pictures? 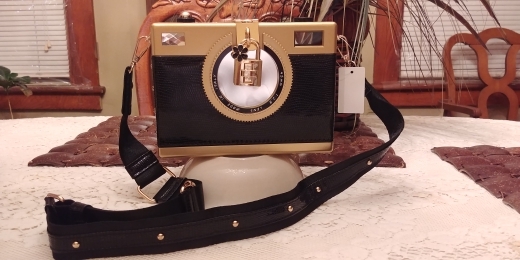 Show your passion for your look always bringing with you this original and cute clutch shaped like a vintage camera. Practical and spacious, this hard case clutch with its retro feel will always be with you when you go out with your friends, or during your photographic excursions, ready to hold your films or your memory cards, in addition to our phone and all the other things that you don’t want to hold while chasing the perfect picture. Buy it to enhance your look or give it to those friends who are dreaming of becoming masters of photography. Love it! Very cute and a nice size - not too small. Super, super cute! Well made and fun ! The cutest camera bag ever. The cutest camera bag ever. Very well made. Great size. Shoulder strap very durable. Packaging perfect. Thank you.